When you’re adding on to your KTM it’s easy to focus on popular components and forget about the basics. Fortunately Enduro Engineering’s Seat is so good it’s hard to ignore. A ton of work has gone into this seat to keep your backside comfortable and still retain the stock height. Enduro Engineering didn’t just cram in more padding though. Needed to lower my bike as much as possible without to need to lower my suspension internally. Enduro Engineering seat help out for another 1/2 more. The seat is all quality and it fit perfectly. I was also able to lower another 17 mm more with the Devol Transformer lowering link too. Got my bike lower over an inch and it was just what I wanted to do and was able to achieve it with both products I've purchased on RockMoutain. For those of you out there a little vertically challenged, this low seat is great for helping out when you need to put a foot down. Easy to fit. Quality product. Perfect for short rider, not very durable. I bought this seat after my first ride on my 2017 KTM 250 XC, realizing it was a big too high for me. After about 25 hours of ride time, I dumped the bike on a hill and it landed on its side. Got home and realized the inset threaded hole for the seat bolt broke out of the plastic molded around it, causing the seat to have a steep angle to one side. It was not a violent crash, and I really don't think that the mounting area for the seat should have broken. That being said, I'm going to have to order another one hoping that it will be a bit more durable. Is at least 1/2” lower but is “Rock” hard!. I recommend if you’re willing to sacrifice comfort over seat height. Extremely hard seat. Bought this because I feel more in control of my bike the better foot hold i have with the earth. direct bolt-on and excellent quality. Very comfortable in spite of the low-profile. This was about 1.25" lower on my bike and has made quite a difference with a PDS rear end. Coupled with the X-Bushing I'm a pivot turning master! This seat fits well and does in fact just bolt on. So glad I bought this seat! Being short with a 30" inseam, I was looking for every little thing I could do to lower the bike without screwing up the suspension. This low seat gave me about an inch. Looks great and fits great. Nice and comfortable. Just enough grip. easy to install, shipped really fast. most importantly its much nicer than the stock seat for the KTM, sits a little lower. Doesn't feel like a 1/2" from stock but it helped! love the seat. Great Product for the $$! Great product. I've owned these seats on several other bikes and the value is great. The seat bolts right into place and is a higher quality than the stock seat. I purchased the low seat since my wife is just a tad short for her KTM 250EXC-F (5'5" tall). This seat is only 1/2" lower than stock, but it put the bike at the perfect height for her. If you're considering lowering your bike, definitely check this seat out! A good rule of thumb is that it the rider can barely touch 1 foot to the ground, this will work and afterwards, the rider will be able to firmly plant the ball of their foot on the ground and switch their planting leg with ease. 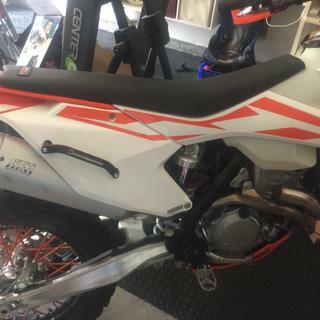 Will this low profile seat fit my 2011 KTM 300 xc ? BEST ANSWER: No, we do not offer a low version for the 2011 300 xc. We do offer a standard height soft version. BEST ANSWER: I measured my EE low seat on he bike by putting as straight edge from front to back and measuring the distance down to the seat at its lowest point. This was 60 mm. Measuring my stock seat it was 51 mm. The stock seat was not on the bike so not as fair comparison. If you measured you stock seat on your bike you could compare it to the 60 mm measurement. Quality and grip good. Fitted well and pleased to have it on my bike. It says it is 1/2 an inch. I set this up on my 150 xcw and it was very noticeable. I am 5 foot 8, and I love riding with it- much more comfortable height than stock for me. Hi, I put it on my 2017 500 EXC-F, and went from being on my tip toes, to being on the balls of my feet. Not major lowering but noticeable. 1/2 inch lower than stock and offers the EE comfort top profile. Are you sure this low seat will fit 18' tpi KTM? how is the grip on this seat ? do I have to buy a seat cover with grip? BEST ANSWER: I can't say... however for what it's worth, the cover is at the very least somewhat grippy. I'm guessing if you're using a low seat that probably means you're small in stature and more than likely don't weigh much. So unless this is going on a 450... well the rest speaks for itself. Thanks for the feedback guys! Yes, our cover is slightly grippier than the stock cover but not the super grippy pull your pants off racer type cover. Worth giving it a try before looking at other options. Hope you enjoy your seat and thank you for the interest! Hello, seat is more "plush" than the OEM KTM seat and has good feel. Would say more grip than factory, but if you are used to after market cover than you may want to add. Better than stock. It's got a more rubbery feel than stock. It was real sticky when new, but it's lost some of that with dirt and dust. No, cover is a gripper style, works decent. Not as good as other gripper covers but gets the job done. The grip is fine. Equal if not better than stock. Depending on your preference. grip is comparable to the stock seat, works fine for me. Grip is good. No cover needed. Will this fit on 2019 Ktm 300xc? BEST ANSWER: No it will not. We are working on a seat for the 2019 model. Current ETA is 2 months. Does this fit the KTM 350 XCF – W ? BEST ANSWER: It will not fit a XCFW model. It only fits the 2017-19 350 EXC and SixDays models. Will this fit a 2004 ktm 250exc? I need a low soft seat for a 2007 KTM xc 525 do you have any of them? BEST ANSWER: Unfortunately, we do not carry a low soft seat for this machine. We apologize for the inconvenience that this may cause. 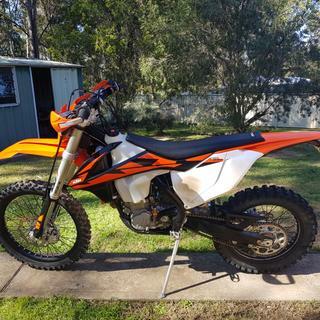 do they have a low soft for a 2018 ktm 300xcw ? BEST ANSWER: We offer a low version, Part # 75-616. It has a more comfortable profile with a density that will keep you from hitting the seat base. The EE website says it's a complete seat. Is this a complete seat or foam and cover only type? BEST ANSWER: This is a complete seat. Will this seat fit A 2015 ktm 250 xcf? BEST ANSWER: Sorry, we do not offer a low version for the 2015 XCF. The closest option would be our Standard Height Soft, part number 75-311.